Here’s a shot of the yurt we stayed in at Beverly Beach in Oregon. 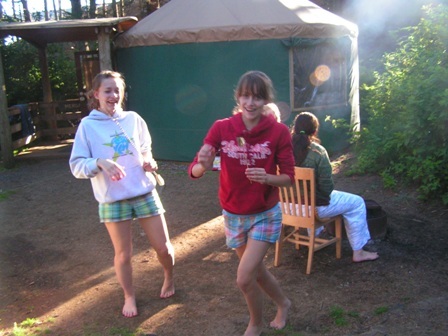 The yurt is an ideal camping facility, in my opinion. Rebecca and Lydia are in the foreground, and Debra is sitting with her back to the camera. This entry was posted on Monday, July 9th, 2007 at 11:01 pm	and is filed under Favorite Photos, Fun Things. You can follow any responses to this entry through the RSS 2.0 feed. Both comments and pings are currently closed. He he, the yurt was pretty cool. But next time, I get to sleep in the middle. Did you get pushed off that bed, Bianca? Yes, it was a tight squeeze for you poor girls!